Andrew Harker has dedicated his life to music and hopes to inspire others to do the same. This is the seventh in a series of articles profiling musicians in Moorestown. This week’s article highlights saxophonist Andrew Harker. During his time at Moorestown High School, Andrew Harker made a bit of history. He was the first underclassman to receive the Louis Armstrong Jazz award, and when he graduated in 2018, he was the first student in 15 years to receive both the Louis Armstrong Jazz Award and Louis Armstrong Band Award. Harker said he’s a true byproduct of the teachers and instructors who helped ignite his passion for music. These days, he’s trying to repay what they’ve given him as he works toward earning his degree in music education from the University of the Arts. He picked up his first saxophone in fifth grade. His two older siblings and his uncle had all played, so it was only natural he would give it a try too. “As soon as I picked it up, I fell in love with playing music,” Harker said. In fifth through eighth grade, Harker learned from his school’s band director and books, but at the time, he hadn’t given much consideration to music as a career path. Things changed, however, when Harker joined the band at Moorestown High School and met band director Christopher Norris. He said Norris saw something in him he hadn’t seen himself just yet. He encouraged Harker to seek an instructor and take private lessons to really hone his craft. Harker began taking lessons with music teacher Tony Salicandro, and the pair of teachers showed Harker some of the fundamentals. More importantly, however, they also instilled in him a joy for learning new music he hadn’t previously encountered. He said their passion for music seeped into him and made playing more enjoyable than it had ever been before. So, during his junior year, Harker made it a priority to expand his own musical library. He started taking more lessons and seeking new opportunities. He played with the All South Jersey and All South Jersey Jazz bands. Harker also made it a priority to begin expanding his craft. He learned to play flute and began doubling – playing both instruments with his high school bands. All the while, Harker wanted to show his fellow students how fun music can be, so, his senior year, Harker became the conductor for MHS’ pep band that plays at MHS’ sporting games. He said music is a community builder, and so he wanted to lead by example and show his fellow pep band members their music has the ability to connect with the crowd. 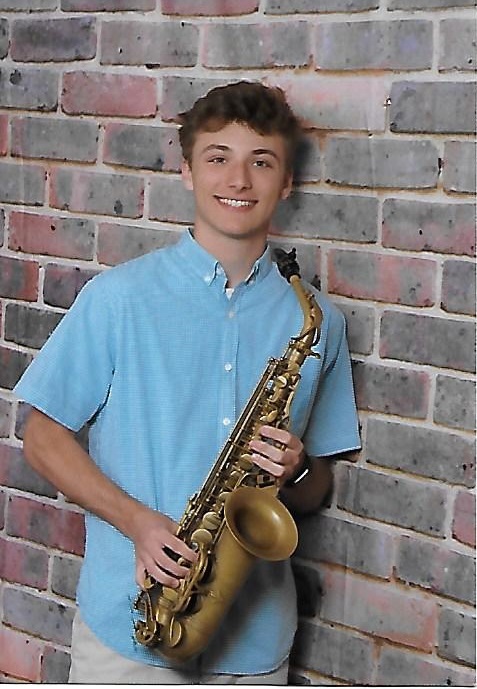 He also played in the pit during MHS’ theater productions – an experience that taught him just how completely in the moment he had to be with music. By the time he graduated, Harker had performed at the Rowan Jazz Festival, nabbed two Louis Armstrong awards, was voted most talented male musician and had earned a scholarship to the University of the Arts. Since starting at UArts this fall, Harker hasn’t slowed down. As a freshman, he nabbed a spot on UArts’ “Z” Band, the top ensemble jazz band on campus. He is one of only five saxophonists in the band. Harker is a performance major for saxophone. He said the competition at UArts is tough, but if anything, it’s just pushed him to try harder and push himself farther. He plans to pursue a master’s degree in music education through the university’s five-year program. He said he hopes to ignite a passion for music in someone just as his teachers ignited his. “I want to one day have a kid to come up to me, and say I inspired them to want to do music,” Harker said. Know a local band, vocalist or performer who should get featured in the series? Email Kelly Flynn at kflynn@newspapermediagroup.com with suggestions.